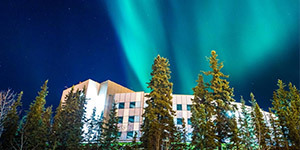 Just 200 miles south of the Arctic Circle, the University of Alaska Fairbanks immerses students in the splendor of the Far North, in and out of the classroom. UAF is Alaska’s leading research and teaching university but still feels like a small college. The Fairbanks campus has about 6,000 students and an 11:1 student-faculty ratio. As a land-, sea-, and space-grant institution situated in America’s Arctic, UAF offers areas of research in cold-region engineering, arctic landscapes and wildlife, Earth sciences, climate change, and much more. The University is a research leader, dedicating over $100 million to research every year. UAF’s Geophysical Institute oversees the Poker Flat Research Range, the only university-owned rocket range in the world. Through its location and the pioneering spirit of its faculty, UAF gives students a backstage pass to America’s last great frontier and transforms an educational experience into an adventure. This is our commitment to our students. The best engineers and scientists are those who spend the most time in the lab, workshop, and field. We take a very hands-on approach and begin teaching our students the design process their first semester. This prepares students for the professional world and makes learning more fun and rewarding. Students utilize the skills and knowledge they’ve gained in practical ways through student research, field work, and national and international competitions. We host a diversity of experiential learning spaces designed to prepare our students to tackle engineering challenges in the real world. Our student clubs and organizations are consistently at or near the top of any given competition. Whether it’s the ASCE Steel Bridge, Collegiate Cyber Defense, International Mine Design, or Design/Build/Fly, our students take pride in demonstrating just how good they are. This application of the knowledge gained from lectures and labs reinforces their knowledge base and hones their engineering skills. Our students win national and international acclaim for their innovate approaches. If you really want to dive in and start competing from day one, the UAF College of Engineering and Mines is your school. 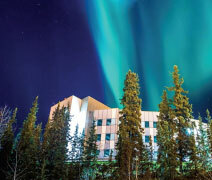 The Arctic is the world’s most exciting research frontier, and UAF is the world’s premier Arctic research university. Through research units such as the Institute of Northern Engineering, the Geophysical Institute, and the International Arctic Research Center, UAF is at the center of cutting-edge research in the North. Through the Honors program and the Undergraduate Research and Scholarly Activity (URSA) program, our students can work with faculty on active research projects or receive funding to do research of their own. Research takes students out of the classroom, off campus, and into the wild of Alaska. Students travel to their research sites via car, plane, helicopter, snowmobile, skis, and sometimes even dog sled! Thus, UAF is a gateway to the spectacular. In UAF’s classrooms, labs, and field sites, we encourage students to upgrade their education with a side of adventure. 2018 Electrical Engineering graduate Brandt Lomen was born and raised in Alaska and chose to attend UAF for the unique opportunities, low cost, and high-quality facilities. As a student, he worked in the Space Systems Engineering lab. 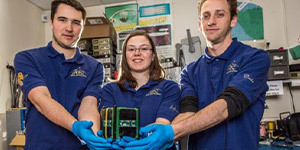 In 2016, the lab’s director requested a testing procedure for solar panels installed on cube satellites. Brandt proposed using LEDs to simulate the solar spectrum, thus initiating the Pseudo-Sun Instrument (PSI) project. Over two years, PSI went through three prototypes, with the final having 630 LEDs and a fully integrated mechanical structure. Brandt presented PSI at the 2018 national meeting of Space Grant directors to universal acclaim. He later received a Dean’s Choice Award at UAF’s URSA Day and won the 2018 Invent Alaska Grand Prize. This will fund students to complete the research with the goal of commercialization by April 2019. In addition, Brandt ended up winning an exciting job upon graduation—he is currently a hardware electrical engineer for BAE Systems. The American Society of Civil Engineers exemplifies the excellence of engineering at UAF. ASCE students are model engineers: engaged with the community, academically excellent, innovative, and competitive. Their most Alaskan tradition is the Ice Arch they erect each February. This is 100% student driven and illustrates UAF’s unique opportunities. The group’s greatest claim to fame is the ASCE Steel Bridge Competition. UAF’s advantage over other schools is our expertise in fabrication. Students not only design the bridge but machine the parts and do their own welding. Hands-on technical experience of this level is rare in undergraduate Engineering programs and has brought our students great success. They regularly place in the top 10 nationwide and haven’t been an underdog since their debut in 1993.